Features/Specs: Produces quality duplicates to meet highest industry standards. 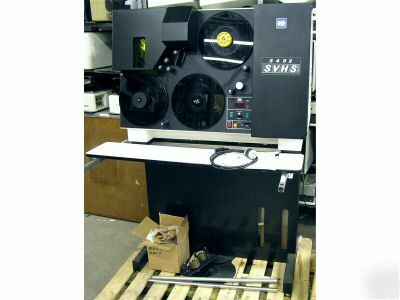 User friendly with flexible operator controls, Computer controlled shut off of both master and supply film prevents "run through" and adds to total operator control. An alarm sounds when job is completed. Automatically purges ammonia from the develper chamber when it is open for service. User safety features include interlocks to prevent exposure to hot surfaces and ultraviolet light. Film Size: 16mm or 35mm; Thickness: 2.0 mil to 6.0 mil; master and duplicating iflm thickness may differ. Absorber System: 2.5 gal (9.51m) reservoir. Accepts 1.2 gal (4.71m) of liquid absorber. Environment: 65-75 degrees F, room light, recommended humidity 60-85%, venting not required. Electrical Input: 208 to 240 VAC, 60 Hz or 210 to 250 VAC, 50 Hz single phase. Condition: This machine is used but has been tested and is in very good condition. It does not have an hour meter, but it doesn't appear to have been used much. There is no corrosion inside and it runs very well. Looking for something that's not listed? We have it in stock, give us a call! -All items are sold as-is unless otherwise noted and all sales are final. or you will be charged this fee. -Wisconsin residents must add applicable state and county sales tax or furnish appropriate resale certificate.